Freelancing 101: What Does It Cost to Be a Freelancer? Working as a freelancer is not all cash profit. There are a lot of costs that are associated with working for yourself that you need to be aware of from the start. From one-time expenses to taxes and insurance, understanding how much freelancing can cost can be just as important as landing clients. 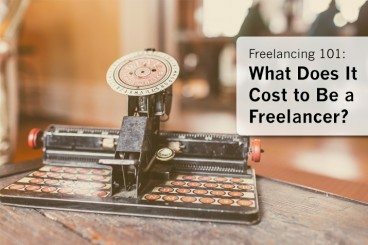 Costs associated with freelancing that impact almost every worker (regardless of location) include equipment and tools, taxes and insurance, marketing and promotion, legal and accounting, training and development and a few additional hidden costs. Today we’re going to be exploring some of the costs to watch out for, so you don’t find yourself facing an unpleasant surprise! One of the first-thought of expenses of freelancing is equipment. For designers, that often starts with a good computer and software bundle. And this can be a pretty large ticket item that you replace every few years. Desktop computer. Depending on the type of design work you do, a tablet or laptop might also be necessary. Software. This includes any paid tool that you need to get your job done. Some software will come in the form of subscriptions, while others will come bas box versions or upgrades on specific cycles. High speed internet connection. Some providers will allow you to qualify for business speed accounts, at a higher fee. Stock accounts for access to photos, vectors or other tools. Printer/scanner/copier. If space is a concern, an all-in-one machine can be a great option. Desk and physical tools such as a good chair, paper, pens, etc. Work phone. You might use your “home” or cell phone for business or you might consider a different line or dedicated Skype account to keep business and personal time separate. Taxes and insurance are some of the trickiest costs to describe because they can be very different depending on where you live. If you don’t know what the rules are, you better find out. Another tax or fee to consider is that of a business license. Costs and need vary by your location. But it is important to have proper licensing if required. Then there’s health care. If you do not have other employment, and live in a country without national policies, this is something you may need to consider. Health care can be expensive and there are a lot of options to choose from. There are a variety of other insurance types to help protect you and your business as well. Insurance can feel expensive but provide valuable protection. There are a variety of insurance types to consider personally and for your business. Business cards, fliers, a website – all of these marketing tools will take time and money. In addition, you may want to budget for promotional items that you can give away to help lure in clients and think about marketing costs such as business lunches, mailing and stationery as well. There are two people every freelancer needs to have on the payroll (or retainer or contract): A lawyer and an accountant. These two people will keep you out of legal and financial binds. And even if you think you can do it yourself, you need the help of these professionals. For legal matters, such as contracts or drafting documents for your business, working with an attorney is imperative. Costs can vary, but you can save some by working legal clinics at law schools. For contracts or documents that will need ore frequent review, it is good to have an attorney on speed-dial. You will also want to work with an attorney if you incorporate or take on another recognized business designation. (An attorney can also help you decide which business designation is best for you.) Depending on the type of freelance work you do, this can protect you personally (such as your home or car) if someone tries to sue. A benefit of working for a big company or agency is that many professional memberships and conferences are part of your employment package. With fees for joining professional organizations often starting at $100 or more per year, this is something that will cut into freelance profits. Conferences can also be another large expense. In addition to registration fees – typically $300 to $600 – there are hotel, travel and food costs to consider as well. In reality, the cost of attending a single conference, especially if it is out of town can easily cost more than $1,000. While attending conferences does come with benefits, it might be something you consider cutting in favor of less expensive training and development opportunities such as webinars or locally-hosted meetings. There are also plenty of smaller training and development costs such as books or online tutorials. While many of these items can be only $25 at a time, they do add up over the course of a year. Make sure to give yourself room in your cost assessment for training materials. The major hidden cost of freelancing comes in time off. If you aren’t working, you aren’t getting paid. There are no paid sick or vacation days. The biggest cost that comes with working as a freelancer can be yourself. Distractions, time “playing” online and other things that pull you from work, can cost you money. Develop a plan for keeping these hidden costs at bay so you can maximize work hours for the greatest earning potential. In addition, you need to put away money toward a retirement fund (if you plan on retiring one day). With no employer dropping a percentage into an account for you, that is something you should consider. Even if freelancing is a part-time gig, putting some money away for retirement is a good idea. Personally, I set aside 10 percent of all earnings – freelance and from my full-time job – for retirement. Consider it a reward for working so hard now, when you get to retire more comfortably later in life. And if you are afraid of putting funds aside in a “locked” account, add to savings all year and make a single deposit to a retirement fund at year’s end. You also need to think about higher household costs if you are working from home. Higher electricity, heating and water bills because of more hours spent using these items each day. While the cost is unlikely to break the bank, you can expect to see increased monthly bills. While freelancing can be rewarding work – setting your own schedule, being your own boss, taking on projects you care about – it can be costly to get started. There are also ongoing expenses to think about. But planning for them makes it easy to know how much money to set aside for these costs to help you figure how much “take home pay” you will end up with.